The French for fail is the regular ER verb échouer. 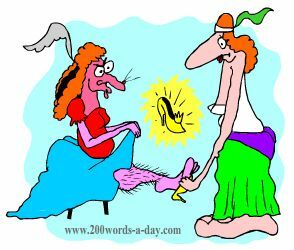 ...imagine the ugly sisters fail to fit the SHOE A-gain and again! échouer can also mean: to be unsuccessful, to fall through (plans), to break down (negotiations). - s'échouer sur (vr): to run aground on, to beach (ship, whale). - faire échouer (v): to cause something to fail. Don't fail with learning French, make better progress with proven techniques like Cartoon Memory Triggers. To remember a word, just think of the pic! fail! échoue ! échouons ! échouez ! ✔ échouer is a regular ER verb. There are over 5,000 ER verbs these being the most common verbs in French. ✔ Learn échouer and it will reinforce the pattern for ALL those other ER verbs. ✔ You can more easily remember words and verbs like the French verb échouer - French for fail - using the techniques of the world's Memory Masters. 200 Words a Day! Free Daily French Lesson Online - the verb in French verb échouer - fully conjugated. French Learning Made Fun and Fast with your free Daily French Verb Lesson - échouer.